International Cello Day is an informal holiday celebrated by cellists and music enthusiasts around the world on December 29. It is dedicated to Pablo Casals, a renowned Catalan cellist, composer and conductor, who is considered to be one of the greatest cellists of all time. 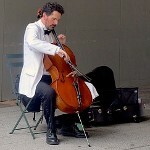 The cello is a bowed, and sometimes plucked, string musical instrument with four strings tuned in perfect fifths. It is used as a solo instrument, as well as in ensembles, orchestras, and sometimes even rock bands. Some of the most renowned cellists include Mstislav Rostropovich, Yo-Yo Ma, Paul Tortelier, and Pabli Casals. Pablo Casals was born on December 29, 1876 in El Vendrell, Catalonia. His father taught him music from an early age, and at age 4 Casals could play the flute, piano and violin. He began to study the cello after enrolling in the municipal school of music in Barcelona. Casals became an internationally acclaimed musician in the early 20th century, when he began to tour Europe. He appeared as soloist and performed with chamber music ensembles and orchestras. Casals is probably best known for his recordings of the Bach Cello Suites he made in the late 1930s. Cellists from all over the world regard Casals as the person who first popularized the cello as a solo instruments. No wonder that International Cello Day is celebrated on his birthday. There are different ways to celebrate the holiday. If you’re a cellist, you can organize a meet-up with fellow musicians, learn a new cello piece, make a YouTube video, etc. If you just like to listen to the cello, you can buy a new recording or attend a concert.